So for my morning perambulation I decided I would walk in the general direction of Lithines by one of the mountain tracks. This was all good and I only had to retrace my steps once when I took a turning that looked more likely to be heading where I wanted but in fact looped back around a nearby mountain and then disappeared in olive groves. After 2.5 miles I ended up above the village then began making my way down, calling ahead to friends there to demand that the kettle be put on for me. I had to do a bit of scrambling because again tracks tended to disappear, but soon arrived at my destination (The picture here is of a flowering cactus in their yard). After a cup of tea, and apple pie and a chat I headed back up the mountain. Upon reaching the top I realised that I’d walked up steep paths, scrambled up some slopes having to use shrubs as handholds to reach these heights, at between half a mile to a mile from the village. I’d done it without pausing for breath and realised that, well, I’m actually quite fit now. So what has this got to do with learning Greek? After this I got back home, went round to my Belgian neighbour to help fix his mosquito doors, returned home to start plastering a wall and was near the end of that job when I saw Anna coming round clutching her books. ‘But it’s Sunday,’ I said, then had to go and check my journal to see what date it was. It was Monday, and she had arrived right on time for my hour-long Greek lesson. With a nod to that here is one of the 7 pages I have learned (mostly – and later ones include phrases). In my last post I promised pictures of turbine spares and a wrecked turbine blade but, before we get to them, here are some pretty flowers to be going on with. Here next is my route past the last of the turbines before I turn and head towards the small village of Handras. This is a walk I’ve taken many times now and without diversions (like one I took recently to try and get a look at an array of solar panels) totals 6.5 miles. The number of occasions when I haven’t gone for a long walk each day since arriving here I can count on one hand. I am also eating little in the way of carbs and the effect has been gratifying. Since that time I stepped on the scales just after Christmas and saw I had edged over 14 stone I’ve lost over 20 pounds. I am in fact just a pound or so away from the supposed upper limit of my BMI, which is ridiculous, because I can hardly be classified as overweight when I need a belt to stop 32 inch waist jeans from falling round my ankles. Here’s the spare parts store for the wind turbines. You can probably see why it reminded me of a NASA museum, though the turbine blades look like a row of high-tech canoes. And here is that wrecked turbine blade. Of course those knowing my opinions on some matters might expect me to rant about these ‘bird-shredding blots on the landscape’ but sorry to disappoint. I think they’re beautiful and impressive. What I object to how they are only profitable if subsidized, how they are proposed as a solution to our energy problems when you would need so many of them that if you could supply power in reverse to spin them up Great Britain could probably achieve orbit (Cities in Flight by James Blish now drops into my mind). I object to the fact that they supply no power when the wind isn’t blowing or is blowing too hard. I object to the fact that many of the ‘usual suspects’ are making shitloads of money out of siting these things on their land etc etc. However, if an efficient way can be found to store their output then a lot of my objections would melt away. That they are often sited in beautiful countryside I have no objection to at all. I guess my thoughts about spin dizzies and James Blish are relevant here. Being a long-time reader of science fiction I’m quite attracted to the idea of chunks of high-tech machinery sitting in wilderness. I don’t see the wilderness as being destroyed, rather enhanced by the contrast. Yesterday I hooked my camera on my belt with the intention of heading up to where I walked the day before to take some pictures I thought might be engaging. These were to be of a wrecked wind turbine blade stored up on the mountain behind, turbine spare parts that look like a collection of items one might see at a NASA museum, and some shots of a particular valley that is becoming increasingly beautiful as everything begins flowering. I therefore headed up the road from my house but rather than take my usual route I left the road early along a path I had discovered on a previous walk. This was a mistake. The way I discovered this path was, while on the way back from a long walk, by heading towards a church I thought I recognised as sitting alongside my usual route up onto the ‘wind turbine mountain’. When I passed the church I just couldn’t find my usual route. Perhaps I was distracted by the field of grapevine supports looking like a cemetery of steel crosses lying ahead. Anyway, I kept going, sure I would eventually hit a road I would recognise. Just when I started to feel completely lost I walked up a short concreted slope and found myself on the road just a few hundred metres up from my house. When taking my next walk to the mountain I realised I had crossed my usual route before – I just didn’t recognise it from an unfamiliar perspective. This is precisely what happened when I tried to retrace this newly discovered path. I took a wrong fork and found myself heading opposite to my intended direction, down into a valley. Having realised my mistake I thought what the hell and just kept going. The village of Sklavi lay sort of where I was heading so I thought I’d go there. Deeper down into the valley the weeds got taller and the path kept disappearing. I found myself mountain climbing at one point, and in other places scrambling up through steep terraced olive groves. After about 2 miles of this I came up out of the valley, followed a track I thought might be heading in the right direction, and found myself back where I started next to the road above Papagianades. Now somewhat miffed I took another route towards Sklavi. This took me past a house surrounded by a tall security fence from behind which a Rottweiler the size of a pony snarled at me. I accelerated my pace to high-speed casual stroll. After this I again began getting lost. I kept trying to get to Sklavi and finding routes looping away again. It was all like trying to follow a seawall path from one coastal village to another in Essex. Your destination village might be 2 miles away as the crow flies, but the path will take you on a 5-mile meander around the mud flats. I found myself down in a valley again in the tall weeds with the paths disappearing. I scrambled through more olive groves and at one point wandered through someone’s garden. Eventually I saw the roofs of the village but as seemed usual was on a path taking me away from them. I scrambled through olive groves to find another path, followed this until it simply disappeared into weeds, then I went down through a steep grove, sliding on my heels down eight-foot tall terraces and eventually dropping out on the road above the village. Here are some shots of the village of Sklavi where, incidentally, the first human I saw was a scot who frequents the kafenion in Papagianades. He refuelled me with tea and tried to offload some Greek pastries onto me (old ladies in these villages apparently think men should be as wide as they are tall). Here are some shots during my walk back to Papagianades (by road) where I finally stopped for a cold bottle of Fix beer. At 5.5 miles this wasn’t my longest walk but with all the off-piste stuff it was as knackering. Much of what I am doing here on Crete this year is about distraction from certain memories, putting a large amount of activity, and time of course, between me and them so, hopefully, they will have less power to hurt. Believe me, seeing your spouse die of bowel cancer is not a set of memories to be treasured. If the technology, as in The Shadow of the Scorpion, was available, I would have my mind edited. Walking of course is a big thing. I’ve mentioned before that I have been susceptible to depression and am aware that one of the best ways to keep it at bay is exercise. Walking is also both easy and highly beneficial. What I mean by this is that going for a run, or lifting some weights are activities I view as onerous. I know they are good for me but don’t particularly want to do them which is why they often fall by the wayside. Walking, especially here, entails stepping out of the door and going and, after a mile or so, a feeling of wellbeing impinges without sweaty grunting effort. Gardening is similar. Weeding, planting and generally eking about in the garden can use up a day without much in the way of conscious thought occurring between my ears. So too with the numerous tasks involved in keeping an old stone Greek house in order. Maintenance is a big part but, at this time of the year, so is the perpetual task of running the wood-burning stove: fetching in wood, cleaning out ash, cleaning the stove-glass doors and sweeping the crap off the floor. Mental activity, however, can be a problem. I’ve found that with the above my mind is just ticking over – doing no more than is necessary. I can’t remember who said it to me but it’s almost a Zen-like thing of just living in the moment without much thought about the past or the future. Was that here in the comments or on Facebook? Anyway, once I start putting my foot to the pedal and mental activity increases it does so, unfortunately, in all respects and of course I start mentally exploring those things I would rather avoid. Then again, I don’t want to avoid thinking perpetually – if that had been my chosen route I’m sure a bottle of bourbon a day would have done the trick. A few days after I arrived here I started on learning Greek again as this seemed ‘safe’. A few days after that I spoke to a neighbour, Anna, and as usual said (in Greek) that I must learn more Greek. She asked me when, the implication being that over the last 7 years I haven’t really been trying. 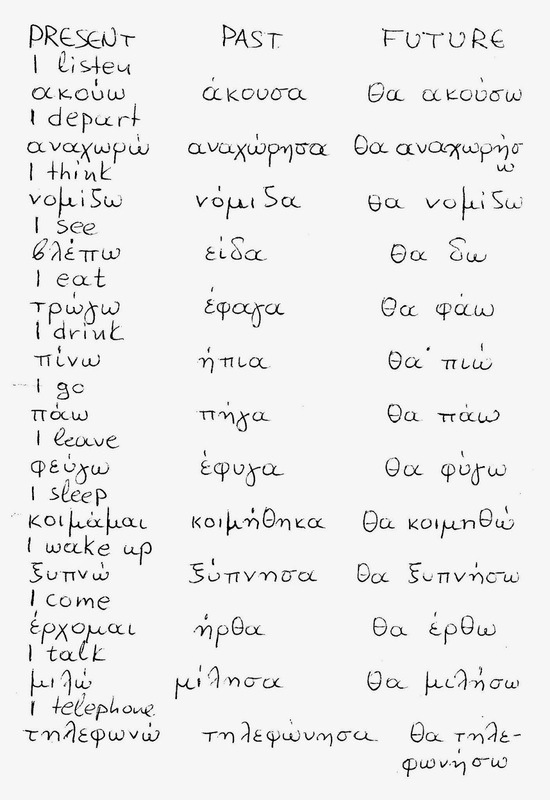 I began to ask her for phrases in Greek and I learned them. She handed over some sheets of 48 verbs written out in phonetic English in their present, past and future forms (which she had given to our other neighbour a Belgian called Jean-Pierre). I began learning these parrot fashion while I was walking. Later, in another conversation, Jean-Pierre suggested we have lessons with Anna. I got these started while also getting Anna to write out these verbs in Greek, which I can read and write at about the level of a 7 year old. On the second lesson she tested me on most of the verbs and I could speak and write over 90% of them. I am even managing to get there with the emphasis that is so important in Greek. Of course there have been downsides. I really shouldn’t have ventured into ‘yineka moo pethane’ or ‘entero carkinos’. Now, I guess, to the writing, which is why most of you are here. I don’t have writer’s block as you can see by the above and as I know by some work I did after Caroline’s death. However the mental investment in such a creative activity is much higher than that involved in learning a language (I’ll add here that learning a language is best done by the kind of parroting that seems lacking in present day classrooms, and involves little in the way of creative thought). To write with any effectiveness requires an honesty that scrapes at the sore points in your mind, while you also have to care about your fictional characters and situations. I’m finding it difficult to care and of course I don’t want to go prodding those sore points. However, I will be getting back to it (this long post is one indicator) and since it is mostly editing I have to do that should ease me into the process. I’ll be back, as one of my favourite film characters said. The next walk was down from Papagianades. I took the road out to the right just to add a bit of distance and get a view back. Here you can see that road steadily being encroached on by a prickly pear cactus and some aloe vera. This is the view back towards the village. My house is the one at the top in the middle. These are pictures on the track down into the valley, then back up to Vori. And here are a few in the village itself. Here are some pictures along the way of the first walk I took. The route leads from behind my house and up into the mountains. The local Greeks don’t have much respect for signs – even on the main routes up here they have holes blown through them. Up the top here I come to the wind turbines. I was told they had been turned off because those maintaining them hadn’t been paid for three months. However I have seen them running since. On the way up I had to stop to rest three times as the track is getting on for as steep as a staircase. Over the other side of the mountain and down (Handras off in the distance to the left) I was floating and high on endorphins. Damn but I felt really good and knew then that I’d done the right thing in coming here and tramping about. One of the numerous churches to be found around here. This is the buzzing centre of Handras and it was certainly buzzing a few years back. Over to the left is a kafenion/taverna where Caroline and I were having some wine with some friends. While we were there an earthquake struck. The lamp post you see, along with others, was whipping back and forth like a sapling. I kept to my seat, since we were outside, others leapt up, while a Greek woman all in black rushed out of her house babbling to god and crossing herself. The road out of Handras and one of the views along the way. This is Etia – a Venetian village plus villa. Nice taverna here I’ll visit when it’s open. And here’s a nice flowering tree in Etia. I could of course fill this blog with hundreds of pictures. Generally up here you just have to point and click and you have a postcard. I have plenty of time to add pictures that might be of interest. I’ve since done this walk many times, with variations, and each time the distance has ranged from 6 to 7 miles.